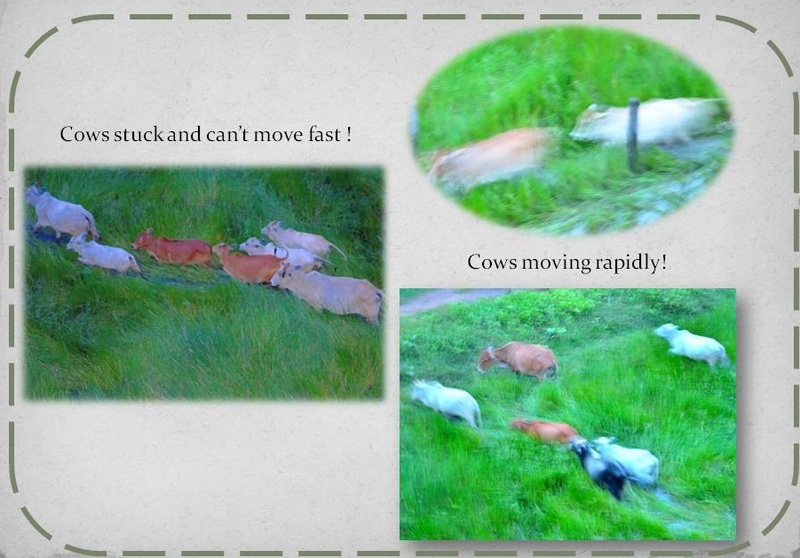 Home › Physics › particles and their properties › What happens when cows move rapidly ! What happens when cows move rapidly ! Cows moving rapidly and their image. Cows moving rapidly and cows stuck. A comparison of their image. Cows not moving and cows moving fast; How does this difference impact the image in a modern digital camera? Honestly I haven’t checked it with old day manual camera neither do I remember what impact motion brings into images taken by such, eg does anyone remember when he/she took a picture of a friend standing in a platform and a train was coming, what happened to the image due to such motion? 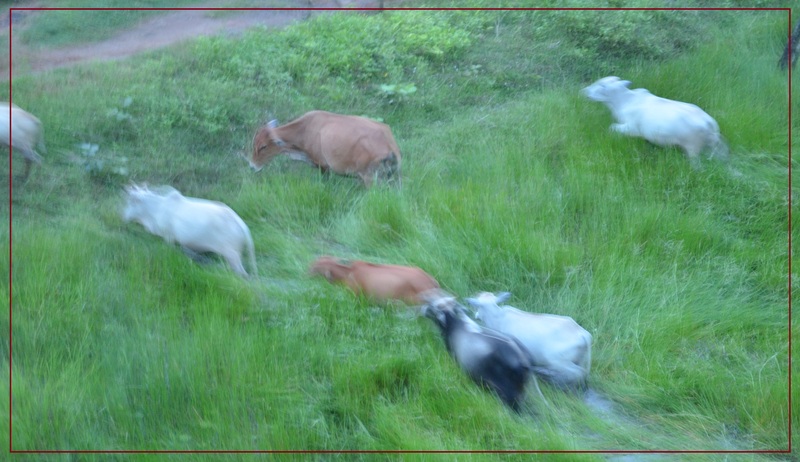 Do you see where the fuzziness is coming from, in the pictures, where the cows are moving? Its coming from the relative motion between “objects being imaged” (cows and grass etc) and equipment of imaging (camera). This fuzziness is quite small when they are both still (the object and camera), wrt each other. Since this article intends to bring out the connection to Quantum Mechanics, like it or not, light processes are all Quantum Mechanical in nature, even though we began understanding light as exclusive waves, many centuries ago, I am going to draw the following conclusion, that immediately strikes me. This effect of small (zero or minimal) fuzziness when the object being imaged is like “stationary states”, for which “average of location” called an expectation value of the location, isn’t evolving with time, so the spread in location information (any point on the object eg) is zero or minimal. That is quite interesting, isn’t it? A stationary state is a multi-fold concept of Physics. For one, it means energy of the state isn’t changing, that is the state is not evolving or changing with time. In that case, in Quantum Mechanics, one takes away the time evolution and exclaims “time independent Schrodinger Equation”. Simply the Hamiltonian has a constant energy, and different levels of energy are called as energy levels, stationary states or orbitals if its an atom whose electrons are being described by such. The other idea of stationary state is how the expectation value (which is simply the mean of a statistical distribution) is not changing because the mean comes from the probability distribution of the wave function amplitude itself, which is governed by Schrodinger Equation whose form changes only when the energy value changes. Expectation value therefore does not change because nothing is moving as such, which simply means holistically: Energy. In our case since the objects are not moving, their corresponding energy is zero or minimal, and the locus of points on the image corresponding to the object points is not spread out, in other words the energy of the light coming off from the object are uniform, or constant in nature. That simply means, amazing, when an object is moving on screen while its pic is being taken, it acts like a flash of light with a slightly different energy than already is, and changes the probability wave pattern or distribution of locus. The fuzziness we see due to a moving object in picture is simply a flash that disturbs the picture. But this flash must disturb the pattern of locus, in a statistical way in consistency with laws of the Quantum world. So if the object is moving, the statistical wave or the quantum wave of probability is mapping itself into the camera image, depending on various factor, such as which part is moving, how, whats the spread in energy due to such and how this spread in energy is related to the spread in time, such as via the shutter speed. There is a certain relation between “spread in energy of light” bouncing off the object being pictured, at some small speed say 5 m/sec of the object itself and the “spread in the time” (shutter speed etc) that’s inherent for the situation for both still objects and moving objects. So in a very interesting way, the Heisenberg Uncertainty Relation of energy and time, is applicable here. There is an inverse relation between spread in energy and same in time. The impact of motion gets quite prominent when the shutter speed etc are quite fast. That’s why a digital camera [such as the DSLR used above] makes the impact of motion known, it translates as fuzziness or “spread in location” information of the statistical wave that the object is, in terms of the light quanta. So spread in time (delta t) is mostly same for both objects, moving objects and not-moving objects in the frame of the picture, but the spread in “wavelength of light”, in Quantum Mechanics, is connected to the “speed of objects” from which light is bouncing, introducing “spread in energy” to the light coming off the object, this spread in energy of light translates as spread in its wavelength and therefore spread in location average from where the light came. 1. Its now a question of Relativistic Quantum Mechanics. Some people argue how it is so, the speed of object is only 5 m/s. Your concerns are not valid, although you have a right to such concerns. One has to think in terms of energy and quanta to realize the inherent laws of Quantum Mechanics. Not in terms of objects like cow or cow speed. The energy is sufficient to alter the statistical or probability wave pattern of the location of the object, here, from a stationary state to a time evolving state. And also its sufficient to alter the energy of the light quanta that are interacting. But my intended point is, this is Relativistic in nature due to the quanta that light are. So first off, ordinary laws of Quantum Mechanics are to be suitably modified. You shall also be enthralled or enlightened as you choose for yourself, that Relativistic Quantum Mechanics is not a completely consistent theory available at the moment, there are some indefinite loops of holes in the logical soundness of its edifice. eg refer to QFT by Landau. Ordinary laws of Quantum Mechanics are what we mostly talk about when it comes to “telling a tale” of Quantum Mechanics, so Heisenberg’s relations are from the latter, also called as Non-Relativistic Quantum Mechanics, more appropriately. So for the problem of describing photography by light, we need Relativistic Quantum Mechanics. For photography by electron also, we need Relativistic Quantum Mechanics. But there is a difference in the laws because of nature of photons or light from that of electrons. The general one among these is, the photons are shamelessly mass-less, I mean they really have no mass. All their energy is momentum. We write E = p. … with an understanding, such is valid in one special unit measurement system, called the Natural System of units. So when there is a fuzziness or spread in the energy of the photons (or light quanta) its simply a fuzziness in their momentum. For an electron this would mean differently, because electron momenta is connected with electron mass, but photon momenta specially enough is not connected to photon mass, because photons might really brag about it, but they don’t have mass. So the spread or probabilistic nature of energy of light here translates as the spread into their “speed” as I am tempted to say. Because momenta is mass*speed, right. But I think, I have committed this mistake for years now, saying, here on this website, photons are the biggest asses out there, fooling folks like me, with their innocuous sounding tricks, that spread in energy would translate as spread in speed. Given that spread in energy is same as spread in momenta, but momenta isn’t mass*speed for pure waves like light, that have turned into quanta due to their influence with the Physicists, it was perhaps absurd for me to talk about spread in speed, sans the mass, which is zero. I think thus the lesson is two; no spread in speed of photons, I have to correct other articles, and two; perhaps such things are the bottle necks for the general consistency of theory by the name Relativistic Quantum Mechanics; the nature of the photons. What then; the spread in energy simply translates as spread in wavelength and distance.That’s all. Its easy to see, energy is distance, time, speed, mass, momenta. speed is 1, mass is 0. What remains is distance and momenta. Thus the uncertainty relation of Heisenberg, of energy vs time simply goes like distance and time. The so called Your Name uncertainty relation, is a relation between uncertainty between location (distance) and energy, as I had suspected before knowing this relation recently. Hence there is also a uncertainty between location and time for the photons. Given time spread is quite small eg in modern camera, the location spread is quite large and this shows up on the image being fuzzy. 2. The second thing is what just struck me, while writing this article. This is regarding stationary state, so the action of taking picture is a dynamic one. If an object is moving we simply have added energy into the system. This causes the system to evolve , in a time dependent Schrodinger fashion. Simply speaking the objects are now sources of light themselves (when light strikes them and bounces) these are merely probability flashes that we capture with our camera, which shows up as fuzziness of the cows or any object that are in the picture frame. ‹ “I can’t believe” !